View of “The Murder of Crows,” 2012. Enter the Park Avenue Armory in the next month to encounter a near-empty Drill Hall, populated only with a barely-there sound installation so surprisingly sonorous that it fills the immense darkness with a clamorous density, bearing down on the crowd at a moment’s notice and then retreating, like the ebb and flow of a tide. In a pool of light at the center of the cavern, one desk supports one horn speaker, surrounded by a makeshift amphitheater of wooden folding chairs. 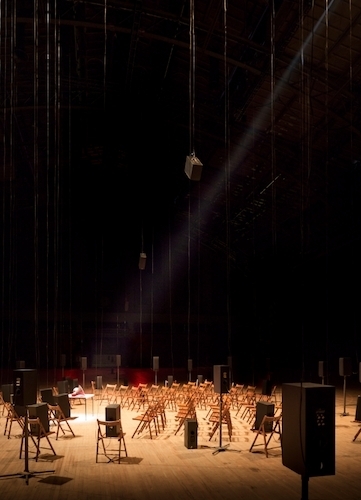 Emanating from the gramophone-like horn speaker is a woman’s voice—Janet Cardiff’s—narrating a dream in which she finds herself fleeing from a blood-soaked factory. Men’s voices, disembodied, begin chanting from surrounding speakers, crashing down over vessel-less drumming and climaxing in a fervor of immaterial instruments. The room empties, silent again. The title of the latest collaboration between Cardiff and George Bures Miller, “The Murder of Crows,” alludes to the particular way in which crows mourn their dead, gathering in “crow funerals” to caw in unison for up to twenty-four hours. The piece is purportedly inspired by Goya’s The Sleep of Reason Produces Monsters, 1799: an etching portraying a sleeping figure hounded by a flock of owls, bats, monsters, and ghouls. Cardiff and Bures Miller, however, also claim to be conjuring the dreams and catastrophes of the twentieth century, bringing to light the deferred promises of a globalization darkened. Though this exhibit has been realized in other settings—among them the Hamburger Bahnhof in Berlin and the Biennale of Sydney in 2008—no place can fully complete the gestalt of battle and catastrophe as much as the Park Avenue Armory. Constructed in 1881 during New York’s ostentatious, crass and corrupt Gilded Age, the armory is emblazoned with paintings depicting battle, and with portraits of such notables as George Washington and Colonel Lafayette, the latter killed in action, perhaps gruesomely. One can imagine the armory herself soaked in the blood of Cardiff’s dream, as an ode to an era bent on arriving at the point of globalization mourned by the murder of crows.